After finishing my team top-25’s and overall top prospects rankings, I figured it was time to look at prospects by position and break them down into tiers. At first base, power is something we usually look for in the fantasy world. While the overall crop of fantasy first basemen might not be quite as star-studded as it was when Albert Pujols and Miguel Cabrera were in their primes, there’s still plenty of power at the position. A total of 27 hitters slugged 30 or more dingers in 2018 with anywhere from six to nine of them having first base eligibility this season in fantasy leagues, depending on your league rules on games played requirements. That power output extends down into the minors as well as the two men that tied for the minor league lead in homers are both on this list. The power doesn’t stop with those two either. Many of the prospects below possess 25-plus homer upside and the guys in tier one also have the potential to hit for a strong batting average to go along with it. The first tier might only go three deep, but there are many intriguing options in tiers two and three that have a chance of moving up if they continue their current developmental paths. You probably noticed Brendan McKay missing from these rankings. That’s because the Tampa Bay Rays recently decided to yank him from the field and have McKay focus solely on pitching and hitting. Good call if you ask me. His overall rank inside my top-100 was largely due to his abilities as a pitcher, more so than his hitting abilities. McKay displays an advanced plate approach with the ability to work a walk, but outside of that, the results have been so-so. Taking him out of the field now allows McKay to focus on developing as a hitter. Will he ever return to first base? Maybe. But for now, McKay will be a DH when he’s not pitching. Check out all of Eric’s top-25 team by team prospect rankings here and don’t miss his top-250 overall prospect rankings for dynasty leagues. Also, make sure to check out the Fantrax Dynasty Podcast with Nathan Dokken, Van Lee, and Ron Rigney. This is the elite tier of first baseman. The trio I believe to have star potential and the ability to anchor your fantasy team for years to come. 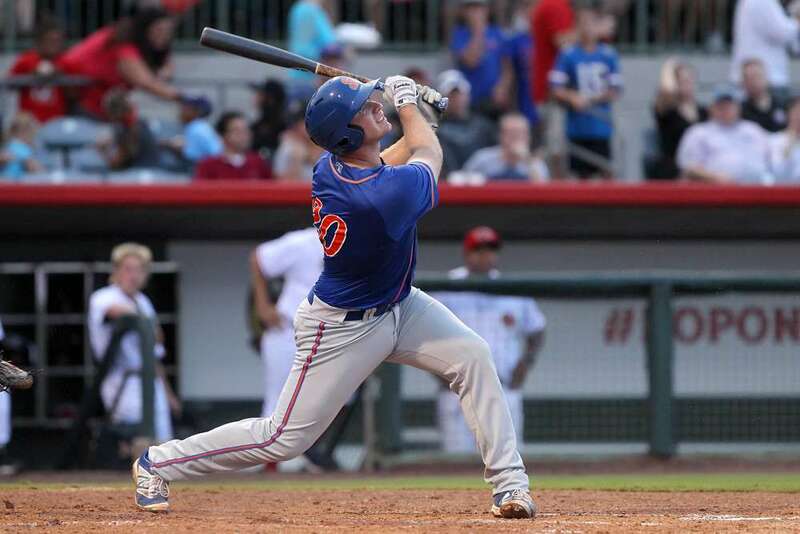 Any conversation about first base prospects has to start with Peter Alonso. After tying for the minor league lead with 36 homers last season, Alonso enters 2019 as one of the top rookies for the 2019 season. The power tool is 70-grade and Alonso makes enough contact to fully capitalize on that elite power. This is a 35-plus homer, middle of the order masher in the making. The other two first baseman in this tier are two of my favorite values for dynasty leagues at this position. Both of them I consider elite, yet, neither have the full elite price tag associated with them yet. Now, isn’t that just a beautiful thing? Grant Lavigne was just drafted last June and wasn’t one of the hot names on the board, so naturally, his price tag isn’t high yet, even after posting a .350/.477/.519/.996 slash line with 21 extra-base hits (six homers) and 12 steals in his first 59 professional games. Oh yeah, he had more walks (45) than strikeouts (40) too. There’s a reason Lavigne is already within my top-100 overall prospects. The ability to hit for average, power, and chip in a little speed for a big man is a highly valuable asset to have in any fantasy format. Don’t forget where his likely future home ballpark is either. Every time I watch Nathaniel Lowe, I become more and more enamored with his offensive potential. Now it’s gotten to the point where I have him knocking loudly on the door to my top-50 overall prospects with a strong chance at getting up near the top-25 in my mid-season update if he keeps this up. Lowe has the ability to hit for both power and average in the Major Leagues and could be a .280/30 slugger in short order, if not more. Grabbing some stock now in dynasty formats is highly recommended. As a Red Sox fan, I loved the Tristan Casas pick back in June. As a dynasty leaguer, you should love the offensive skills that Casas has. There’s a reason I ranked him 2nd in the Red Sox system, slightly ahead of a more established hitting prospect like Bobby Dalbec. Casas can mash. He has nearly the same power ceiling as Dalbec and projects to hit for more batting average than the Dalbino. Whether he stays at the hot corner or slides across the diamond to first base is still up in the air, but there’s no question that Casas has the upside to become an above-average offensive performer at either position. After moderate success in 2015 and 2017 (Only one AB in 2016), Tyler Nevin broke out in 2018, finished second in the Single-A California League in batting average at .328, just five points behind his teammate, Colton Welker. Some of his above-average to plus raw power started creeping out as well. Nevin finished with 25 doubles and 13 homers in 100 games last season and has additional power upside in that bat. Plus, you know, Coors Field. Nevin is a first base prospect on the rise that can still be acquired for a reasonable price in dynasty formats. Ever since being taken 38th overall in 2017, all Brent Rooker has done is hit for power. In 192 career games, mostly in the Florida State League (A+) and Southern League (AA), Rooker has 43 doubles and 40 homers while hitting a respectable .263/.343/.497/.839. Rooker has one of the highest power upsides at this position and enough contact skills to keep his batting average north of .250. With just a little more time in the upper minors, he should be ready to contribute up in Minnesota during the summer. Neither Nick Pratto or Evan White project as big power guys, more so 20-homer types that contribute a strong AVG/OBP. Josh Naylor, on the other hand, does project for more power and started showing off that plus raw power last season in Double-A. To boot, he also walked (64) almost as many times as he struck out (69) while hitting .297 with a .383 OBP. If Naylor can continue to hit for both average and power in 2019, he’ll continue his ascent towards top-100 status. A common theme with this tier is high strikeout rates and questionable overall hit tools. Nobody embodies that more than Bobby Bradley. The 22-year-old has four straight seasons on 23-plus home runs, but the strikeout rate has been 27.7% over that time and the batting average and contact skills continue to deteriorate. Bradley recorded a career-low .224 average and .774 OPS last season and is quickly falling out of favor in the dynasty world. That plus raw power sure is enticing though. Another to have fallen out of favor, but for an entirely different reason is Pavin Smith. What are the strengths that we look for from our first baseman in fantasy? Power and run production. Smith possesses solid contact skills and a strong plate approach, but has a limited power upside and a swing more geared for gap shots than over the fence power. Can Smith hit around .270-.280 with a .350 OBP? Absolutely. Just don’t expect more than 12-15 homers to go along with it. A pair north of the border have some intrigue due to their power upside. Ryan Noda and Chad Spanberger, both possess plus raw power with 25-plus homer upside, but have some questions surrounding their hit tools to go along with the pop. At least with Noda, the approach is solid and he’s had one of the highest walk rates in the minors in each of the last two seasons, including a stellar 20.7% walk rate in 2018. Give him a bump up the ranks in OBP leagues. Where’s the power? Right here. Where are the questionable hit tools? Also right here. If the last tier had some questionable hit tools, this tier dwarfs that. Remember how I mentioned that there was a tie for the minor league home run lead this season? Alonso was obviously one, tieing lesser known Ibandel Isabel with 36 round-trippers. Isabel hit his 36 in 81 fewer at-bats too. That’s now 64 combined homers in his last 841 at-bats since the start of the 2017 season. Unfortunately, those have come with a paltry 35.6% strikeout rate over the same timespan. Due to the hit tool and pitch selection, I can’t see him carving out a regular role in the Majors right now. A name on the rise to monitor from this tier is Seattle’s Joey Curletta. The big 6’4 first baseman recorded the best season of his career in 2018, finishing with 23 homers, 24 doubles, 94 RBI, and a .282/.383/.482/.865 slash line. He also raised an already solid 11.7% walk rate up to 14.6% while slightly trimming his strikeouts down to 23.4%. The plus raw power has always been there and now is showing up more consistently in games. He’s an enticing flier in dynasty leagues. If you’re looking for potential 2019 value, Rowdy Tellez is your guy. If Justin Smoak or Kendrys Morales go down, Tellez is likely going to be the primary beneficiary when it comes to playing time. While I still question whether he can be an everyday type of player, Tellez’s bat needs to be monitored if playing time opens up. He’s hit for average and power during his minor league career, just not at the same time. Lastly, keep an eye on Tyreque Reed. The hulking 6’2, 260-pound first baseman hit .350 in the Arizona Rookie League in 2017 before hitting 18 dingers in 344 at-bats last season. There’s plenty of power projection here, but it still remains to be seen if Reed can make enough contact to hit for a respectable batting average. Most of his damage last season came in July/August too, where Reed hit .307 with 11 homers in 179 at-bats. For the rest of the season, he hit just .223 with seven home runs in 166 games. I want to see Reed put it together for a full season before moving him up the list.